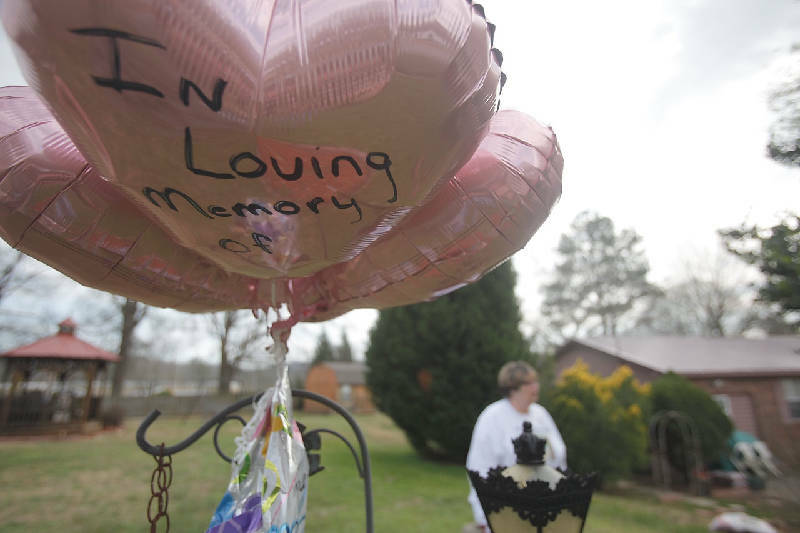 Leatha Shropshire stands near balloons memorializing her mother, Helen McKin, whose body was discovered among hundreds of others on the grounds of the Tri-State Crematory in 2002. Questions linger about why 10 years have passed without a promised memorial being erected to honor the hundreds of people whose bodies were discarded and left to rot at Tri-State Crematory in Noble, Ga.
"A lot of people that worked the tragedy, they want to forget it because they feel like it was a black mark on their county," said Leatha Shropshire, whose mother's body was found lying on the ground in her funeral clothes, her dress hiked up. "[But] I don't feel like our loved ones should be forgotten." But Walker County officials say nothing was done with the $45,000 awarded in 2002 by the Georgia Legislature to build a memorial because no one could agree on where and how one should be built. "I heard from some people [that], 'We do not want a memorial in Noble; we never want to think about it again,'" said Walker County Sole Commissioner Bebe Heiskell. But people from Noble disagreed and wanted the memorial built as a park because their town had been portrayed in a bad light, Heiskell said. At the beginning of 2012, as the 10th anniversary of the first discovery of the bodies approaches on Feb. 15, Shropshire began an online petition to prompt county officials to finally spend the money. A separate memorial already is in place at the Tennessee-Georgia Memorial Park southeast of Rossville to mark the spot where 133 unidentified bodies from Tri-State are buried. In January, after media outlets notified the public of the memorial petition, several people contacted Heiskell wanting to work on the memorial, including Vanessa McKeehan, who works at the memorial cemetery. "We want to help [Heiskell] in any way we can," McKeehan said. The memorial is being designed with the name of everyone identified at the crematory carved into the stone, McKeehan said. After designing the memorial, officials will take bids and pick a company to make it. Heiskell said she hopes to have the memorial complete by this summer.